Areas east of Springfield still have some shots of sleet and ice accumulation possible, a back edge to the worst of it is in sight! 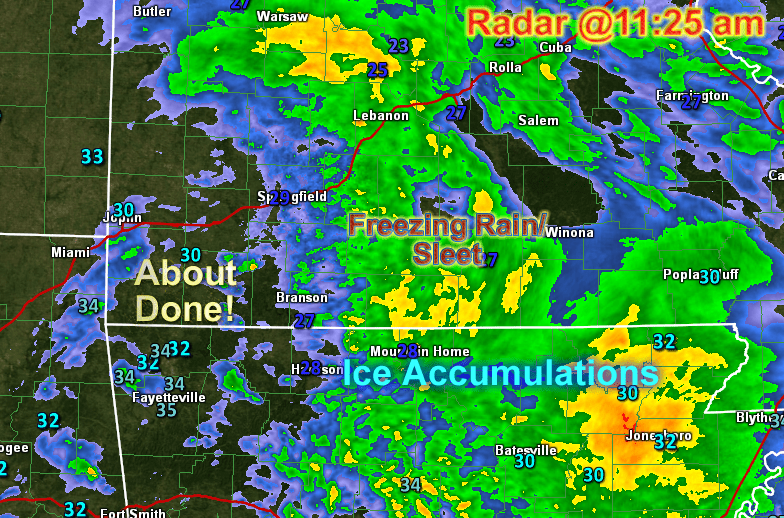 We have had reports of up to .25″ of ice (not sleet) on some surfaces. But a lot of what fell changed into sleet. 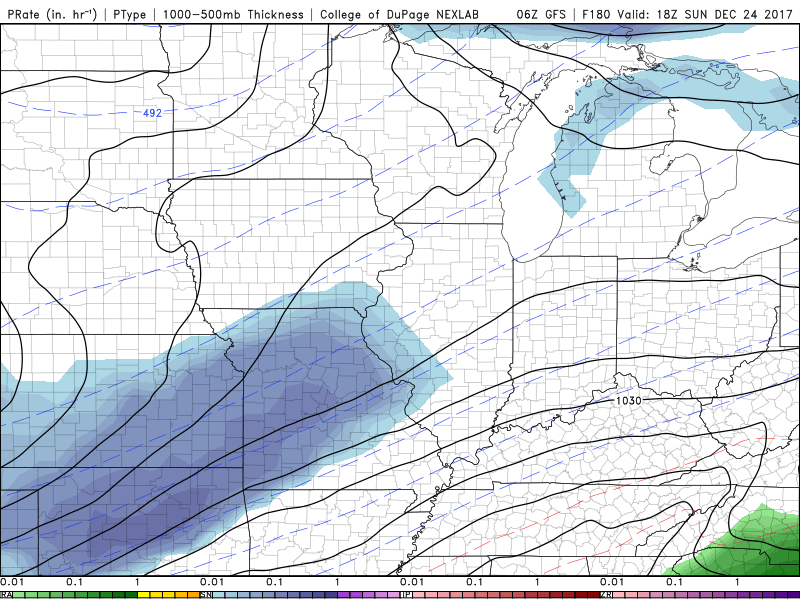 The reason for this had to do with the unstable air existing over the cold air at the surface. This lead to more convection (hence the lightning and thunder) which features rapidly rising air. This air cools as it rises, it converts a freezing rain layer into a sleet layer. This cut down on a lot of potential ice accumulation! To complicate matters, some small hail was also included in some of the thunderstorms! 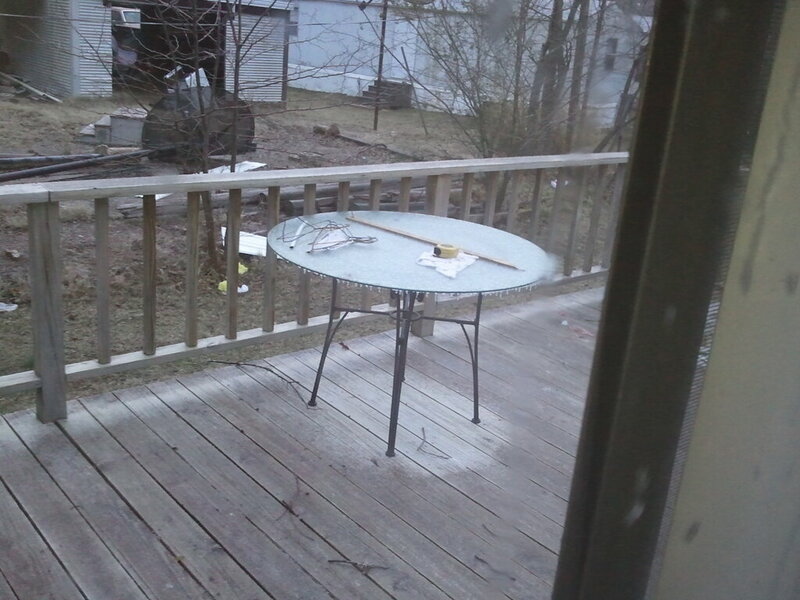 I enclosed a picture from Willard today of some pea-sized hail. 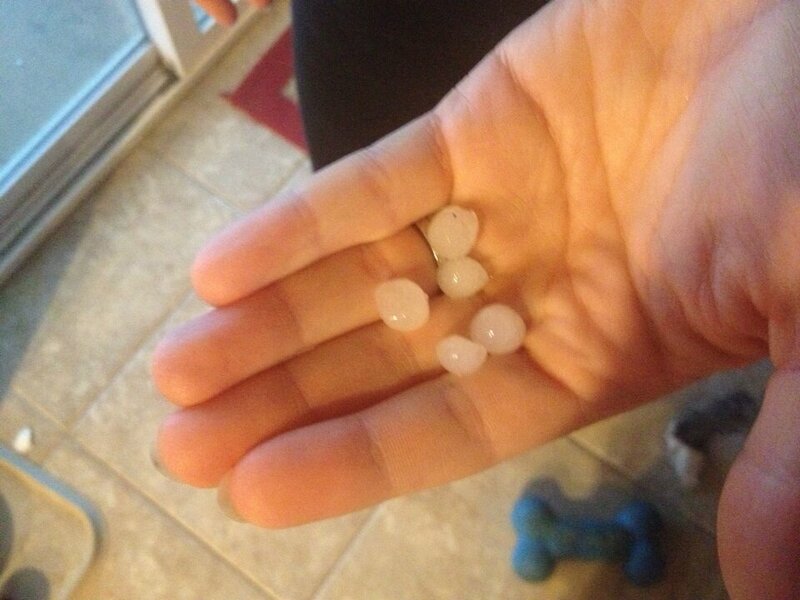 Hail looks smoother while sleet is more grainy. Another tenth of on inch of ice accumulation is possible with the band of showers east of Springfield over the next few hours. Sleet will be mixed with much of this. As for Springfield, stick a fork in it, we’re essentially done with the heavy stuff! 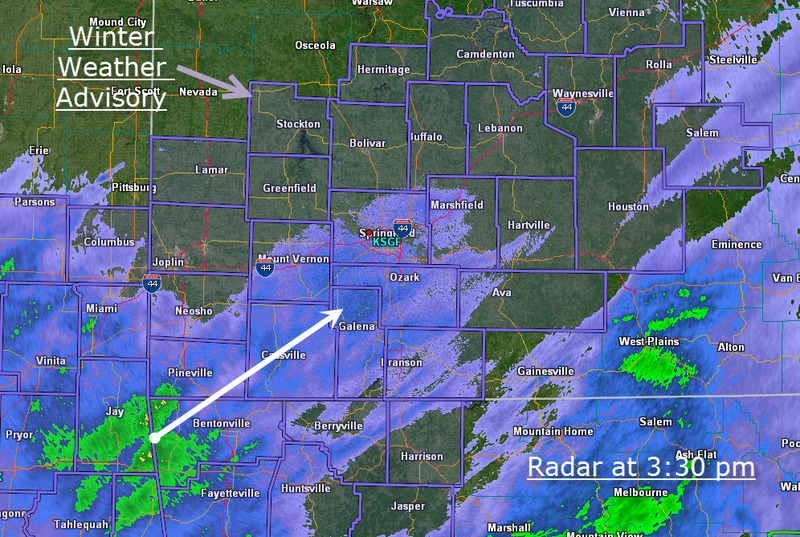 Overnight, a wave of lighter snow and sleet moved north over the Ozarks. At this hour, convective bands (with some lightning and thunder) are organizing over northwest Arkansas and southwest Missouri. 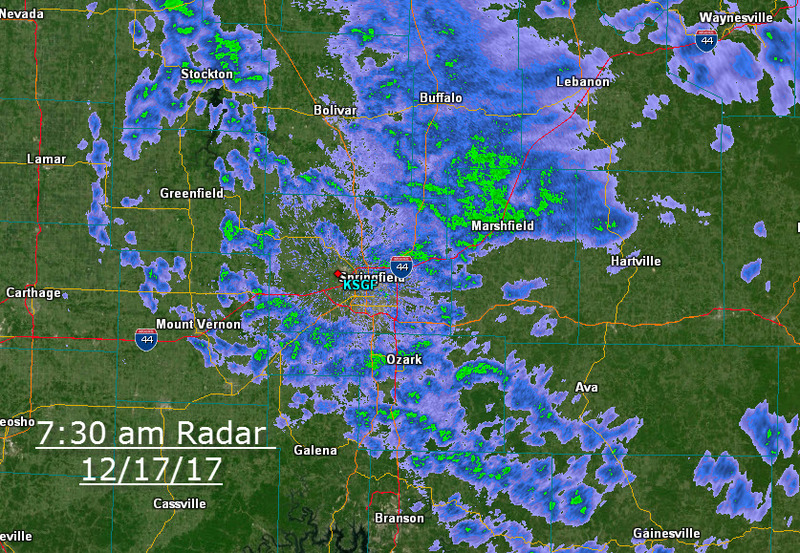 This represents heavier precipitation rates and with temperatures in the upper twenties, freezing rain and ice accumulation will continue for a few hours. There might be sleet in the core of some of the heavier bands, reducing ice accumulations somewhat but overall, expect conditions to worsen through mid-morning, especially north and east of Springfield. The real question for the day is: how much warming will occur at the surface and where? My belief is that Springfield will see a recovery to near 32 degrees, still icy but more manageable. The concern all along has been the persistent below freezing situation which will set up for areas of northern Arkansas and perhaps south-central Missouri later this morning and afternoon. An ice storm warning is still in affect for a portion of that area. 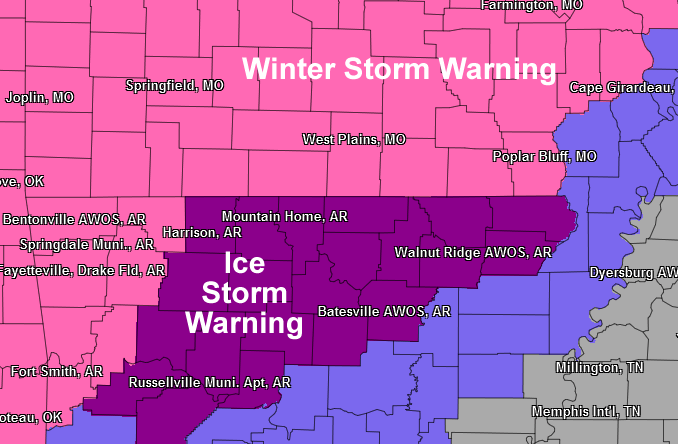 All of the Ozarks are under some short of winter storm warning this morning for later tonight and Thursday. Ice accumulation is still a concern. A huge amount of humidity is being lifted over a dome of cold air which will result in lots of rain aloft, which will transition to a mess in the Ozarks on the ground in the form of sleet and freezing rain. There is an expected transition of precipitation type for many in the Ozarks. When the initial wave comes in tonight, it’s expected to be snow and some sleet. This will probably stay snow in areas from let’s say Lamar to Camdenton northward. 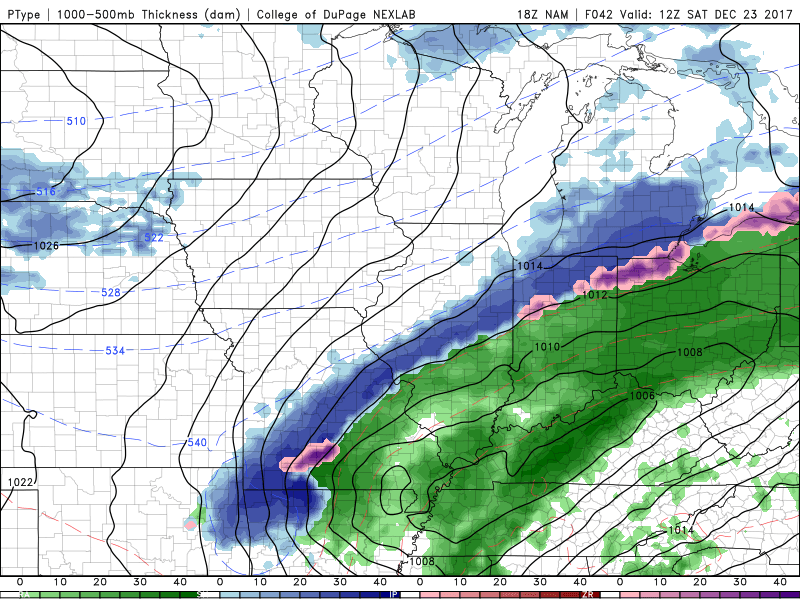 As for Springfield, snow will give way to sleet and eventually freezing rain (ice) by dawn on Thursday. 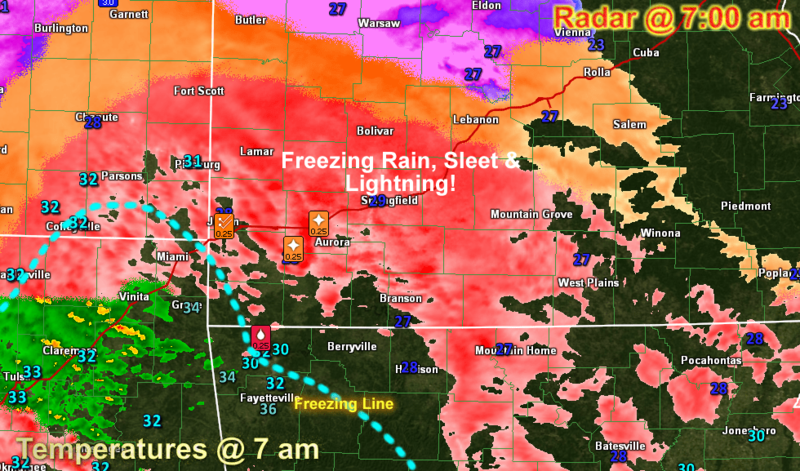 Freezing Rain vs. Sleet: What’s the Difference? 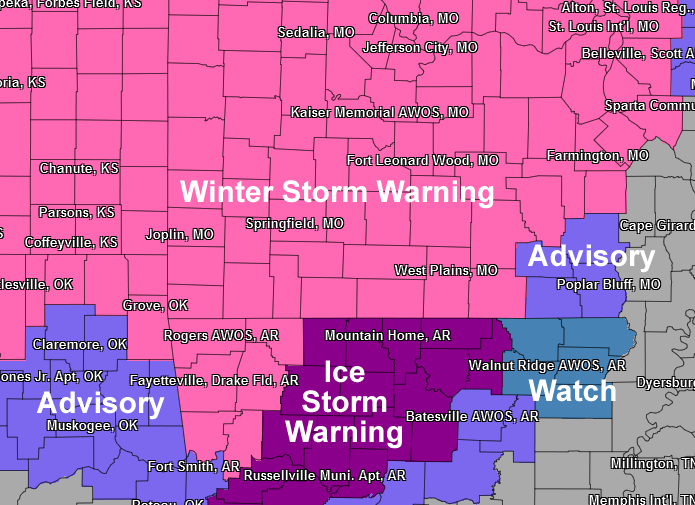 Areas of northern Arkansas and south-central Missouri will hold on to freezing rain the longest and have the biggest threat of significant ice accumulations. I expect Springfield will see several inches of snow/sleet overnight tonight with a glaze of ice on top of that starting sometime in the early morning hours of Thursday. The snow up north could amount to 1-3″. 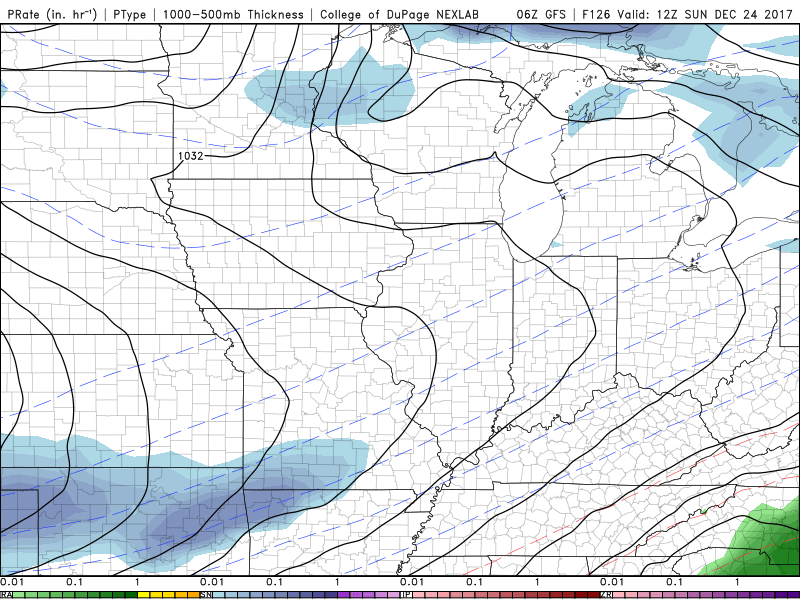 This of course will become a major snowstorm north and northwest of the Ozarks. 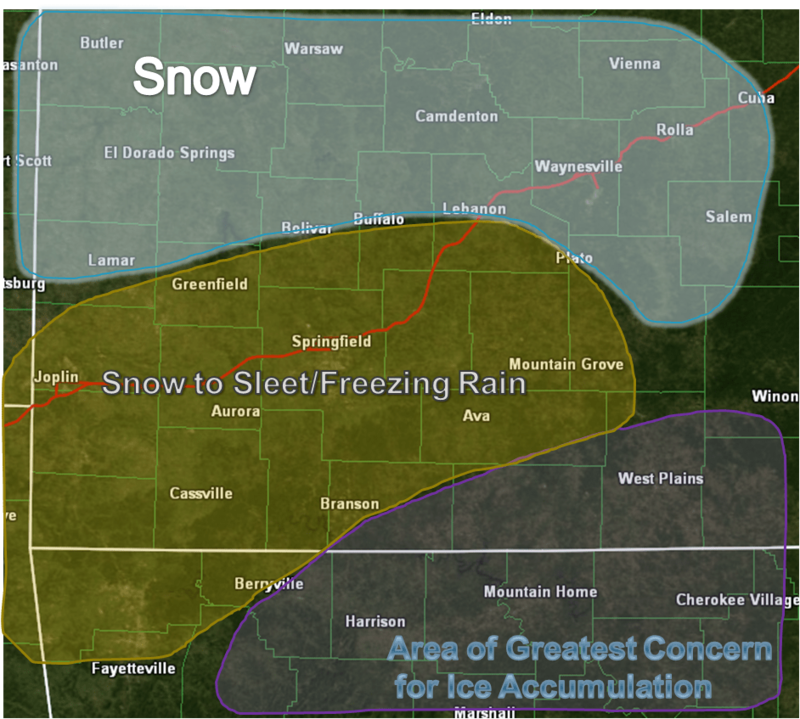 Ice accumulations will be between .10 and .40″ I think with the higher amounts in the area specified on the graphic. I will post a winter storm update after the morning computer model runs come out, right around noon. I will post a video review/blog by late afternoon. Also, look for a live web show tonight to discuss the situation. Details coming up later today! Winter Mix, What Does This Mean? When I use the phrase “winter mix”, it refers to some combination of snow, sleet or freezing rain (ice). The term is used whenever any of these are possible over a certain time frame. While the “general” layout is for snow to occur closest to the colder air with sleet, freezing rain and rain occurring in bands toward the warmer air (usually in a southerly direction), there are exceptions. One is terrain. An increase in elevation means colder temperatures which can change the precipitation type. Or the opposite, occasionally cold air becomes trapped in valleys and alters precipitation type. Also, convective (rain/thunder) bands tend to cool a column of air near the ground and turning what might be a freezing rain situation into sleet. This is liquid (rain) aloft which falls into subfreezing air near the surface deep enough to freeze the drops into ice balls. Sleet “tings” when it strikes windows. Sleet accumulates like snow but because it is essentially little ice pellets, it doesn’t accumulate nearly as fast. It actually offers some increased traction on roads when compared to snow. Nearly the same as sleet except that the drops stay liquid falling into a much shallower subfreezing layer at the ground. These “super-cooled” rain drops will then freeze on contact with surface objects, especially those off the ground such as trees and wires. Freezing rain producing ice accumulations over a half inch can cause branches and wires to snap from the weight. An ice storm is born! I think this is going to be a lot of fun! 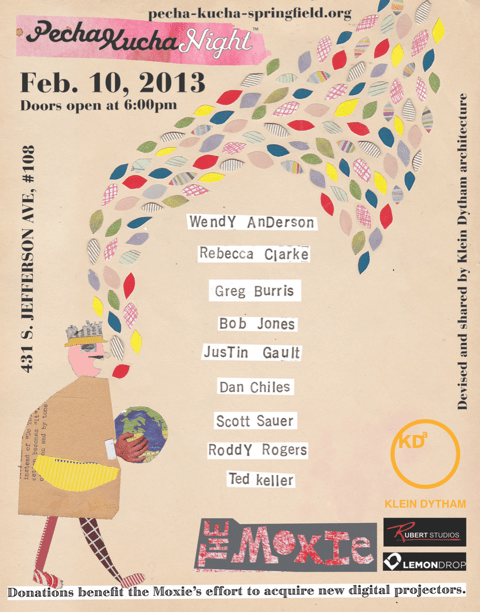 I was invited to speak at an event called PechaKucha this Sunday evening. Here’s how it works. Presenters are given a topic. They then come up with an interpretation of the topic in the form of a slide presentation. But the twist is this: each slide can only be up for 20 seconds and there is a limit of twenty slides. So, each presenter has 400 seconds or 3 minutes and 40 seconds to speak. Also, the slides must be pictures only! The topic this Sunday is Climate Change. I have a few things I can address on this subject! Hopefully, I can make folks think about things they hadn’t before. The PechaKucha is being held at the Moxie with donations going to help the theater acquire a new digital projector. It is this Sunday, February, 10 starting at 6 pm. The Moxie is located at 431 S. Jefferson, #108. You can learn more about PechaKucha at this website. My thanks to Russ Rubert, a fellow Rotarian, for seeking me out to be a part of this event! The day will be best remembered for the extremely generous rainfall which was so desperately needed in the area! 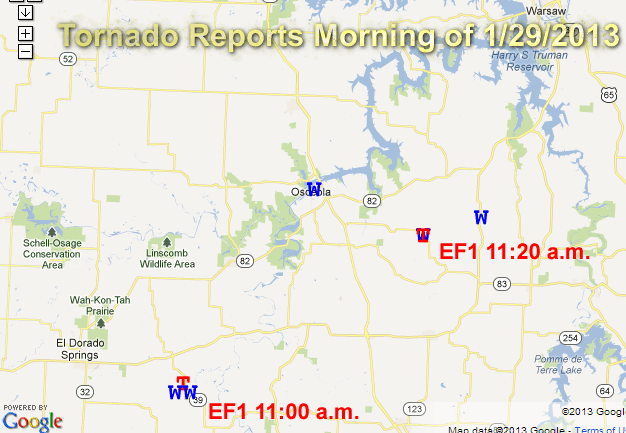 We also had two confirmed tornadoes and several tornado warnings along with some wind damage in the Ozarks. 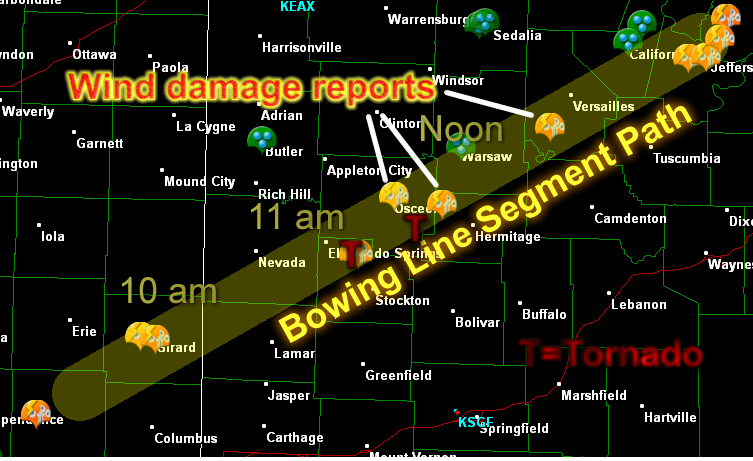 The two EF1 tornado reports north of Springfield are connected to a rapidly-moving bowing thunderstorm segment which traveled from southeast Kansas to Morgan County during the morning hours. The first EF1 tornado occurred around 11 am just N of Cedar Springs in Cedar County. A second EF1 tornado happened about 20 minutes later in St. Clair County about 4 miles NE of Gerster. The bowing segment also produced wind damage at various points along the path. Another bowing line segment came out of northwestern Arkansas late in the afternoon. 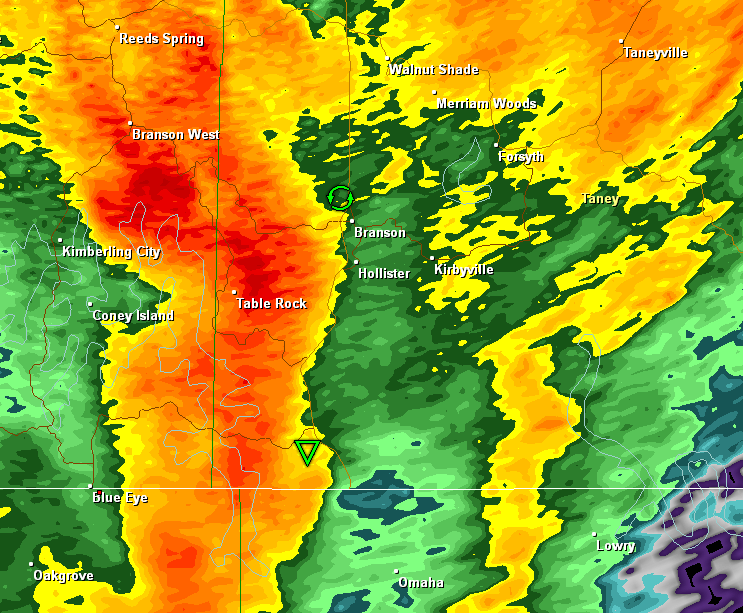 The rotating portion of this segment passed through extreme southeastern Stone County and southwestern Taney County. It was responsible for a tornado warning for those areas during the 4 o’clock hour. Several areas of rotation occurred with this line segment and wind damage was reported but thus far no tornadoes have been identified with this system. The rain was the other big story. I included the latest drought summary for the Ozarks which doesn’t include the rain of Tuesday. 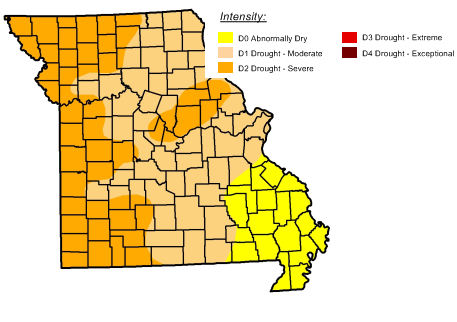 The drought is considered moderate over much of Missouri and more critical over portions of northwest Arkansas. By the time the report comes out next Thursday, the generous rains of Tuesday will be included and it will be interesting to compare. Nearly all areas of the Ozarks received at least one inch of rain. 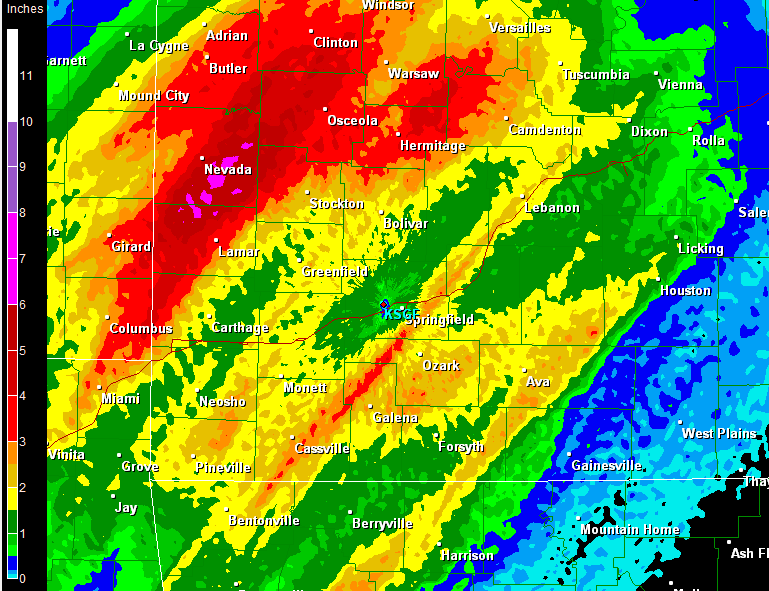 Many got more than two inches or even three inch plus totals.